AVENGERS ENDGAME - Crew Jacket - MCU Original crew gift from Marvel. Size is XXL fits like a XL. The jacket is NEW never worn. What you see in the photos is the jacket you get. No INTL shipping. Promotional jacket for the movie ‘Long Shot’ given out at the SXSW World Premiere. In great condition, never worn. Size medium, has loose fit. It has been in storage ever since. Recently rediscovered! Classic, lightweight lined windbreaker-type jacket with snap button front closures, optional drawstring bottom and 2 side pockets. Features iconic trumpet logo decal on front with the the phrase "Who's the coolest guy in the world?". Up for sale is this Rare Adidas The Waterboy Jacket. Adidas logo has cracking as seen. LAME DUCKS, Movie Crew Jacket, RARE find! XL Good Condition! XL Good Condition! • Green Wool Body. • Satin inside with Chest pocket. • Perfect Embroidery on back. Great item that was not for sale just available to the crew. The jacket is in mint condition, never worn. I am 5'8 and 150lbs and it fits perfectly. Star Trek Deep Space Nine Cast and Crew Jacket...Not Sold in Stores. Star Trek Deep Space Nine Cast and Crew Jacket...Not Sold in Stores.. Shipped with USPS Priority Mail. Grey Leather with Grey Wool, GREAT CONDITION! • Inside is quilted nylon, Black. • In storage box - worn very little if any! Diagnosis Murder. Jacket has two small tears- one near the cuff and one near the back of the armpit. Fleece collar and lining are in excellent shape for its age! Back reads Condition is Pre-owned. New ListingVintage 1991 "Cool World" Crew Jacket, Large, very good condition. Vintage 1991 "Cool World" Crew Jacket, Large, very good condition. From the Ralph Bakshi animation/live action cult film starring Kim Basinger and a very young Brad Pitt. Never worn, very good condition, and very WARM. There are two hand pockets on the front. The lettering on the right sleeve reads: DOLBY ATMOS. Great Condition, not worn, in storage! Manufactured by ID Wear. 60% acrylic, 40% polyester. Made in Canada. Full front zipper with Velcro storm flap. Two front slash pockets. Has inside pocket. Waist lays loose and does not have elastic. Screen printed graphics. In very good condition with light normal wash wear. This is from the 74th Academy Awards which took place in 2002. The 74th Academy Awards logo is embroidered on the right sleeve. This is a jacket that was only available to those who worked the Academy Awards show otherwise known as the Oscars. This is from the 83rd Academy Awards which took place in 2010. The 83rd logo is embroidered on the upper front left. 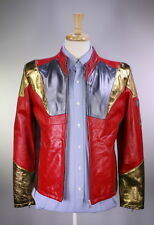 This is a jacket that was only available to those who worked the Academy Awards show otherwise known as the Oscars. BRUCE ALMIGHTY Crew Jacket with hood. Never worn! •This jacket is reversible! •Logo is low key on the bottom right of cuff! SECOND PHOTO IS OF THE JACKET INSIDE OUT! Lethal Weapon TV Series Cast & Crew Season One Jacket Rare Exclusive Collector's. Shipped with USPS First Class Package. Sold as is! No refunds! Never worn, like new 100% authentic THE BUCKET LIST 2008 movie NIKE PARKA JACKET. Features multiple inside pockets for storing your cell phone, headphones and cash as well as a plethora of pockets on the outside that both zip and button for added security. Bought this at a visit to Universal studios around 15 years ago. Been in my closet ever since, I may have worn it a total of 2 hours. The size is 50. It could probably use a cleaning just to soften the leather up a bit. Otherwise in very good condition. Let me know if you need any more photos. Message me with questions. This jacket was a promotional item made exclusively for HBO. It has a zip-out liner which also has openings in the upper part of both sides to allow access to the hidden breast pockets. It has 5 buttons up the front and there is an extra one in the left-side hidden breast pocket. Catwoman embroidered on front, Catwoman Picture embroidered on back. LAID FLAT ACROSS THE CHEST FROM SIDE TO SIDE 24". This Jacket is in Mint NWOT condition. John Waters “Serial Mom” black denim jacket. “Serial Mom” embroidered logo above pocket. Metal buttons and patch pockets. International Denim Authentic Jeanwear. Owned by Production Designer Vincent Peranio. 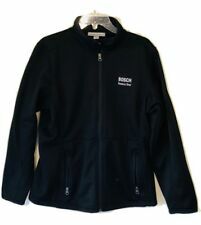 FEATURES "SCHOOL OF ROCK" MOVIE LOGO ON FRONT LEFT POCKET AND LARGE LOGO ON BACK, SIZE XL ADULT, JACKET BY PORT AUTHORITY OF U.S. DESIGN. Get Images that. Make Supersized Seem Small. This jacket has never been worn. Duck Detroit. FILM CREW JACKET. THIS IS A GREAT PIECE OF BLOCKBUSTER VIDEO HISTORY. VERY LIMITED AMOUNT OF THESE WERE GIVEN OUT. LARGE AMOUNT OF BOWIE, STONES, AND TONS OF OTHERS. JUST CHECK BACK OFTEN AS I DIG THEM OUT AND GET THEM LISTED. Pit to pit: 25”. Shoulder to shoulder: 21”. Barely worn. Very small drip stain on right shoulder (shown in photo). Just a wonderful leather jacket! Patches on each sleeve. Rare, unusual and 100% authentic denim crew jacket from the 1988 film Big Top Pee-Wee. I'm the original owner. This jacket is highlighted by brilliantly colored embroidery of the film's logo in a "circus font.". Amazing, mint condition for age. Don’t think it was ever worn. Men’s Large. Own a piece of Hollywood today! Very good condition with a bit of wear around the patch. Leather patch located on the upper lefthand front of the jacket. It's in excellent condition like new for it's age. Very warm jacket. This is a Mission Impossible III Jacket. The size marked is L.
Satin Dugout Jacket. Ricky “Wild Thing” V aughn. The size is listed as a Ladies Large. Great Condition. NOW FOR THE BORING STUFF! I WILL HAPPILY COMBINE MULTIPLE WINS. Vintage 1991 "Cool World" Crew Jacket, Large, very good condition.